Indirect, bright light with a high blue content has an energizing effect and provides support for working. The aim of illumination at the workplace should be the same as in other areas of application, in other words to provide those present with the most natural light environment possible, which is based on the natural course of daylight. 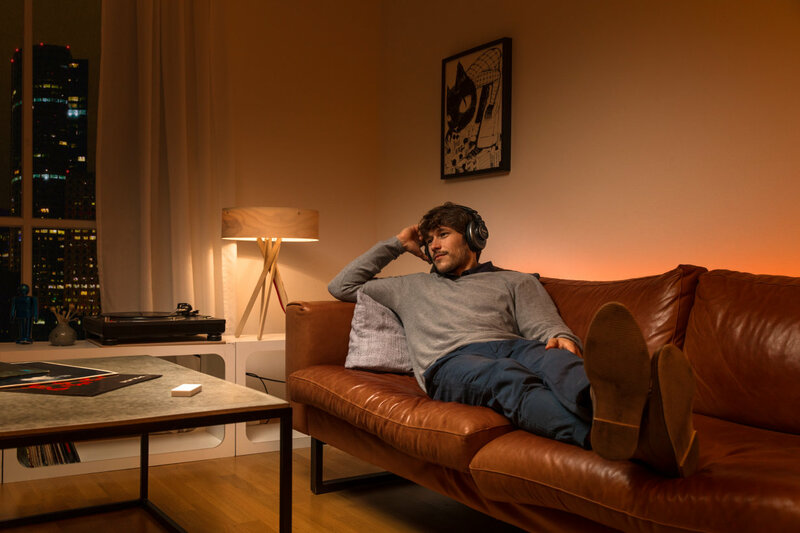 Automatic control is recommended for extensive ambient lighting, which creates indirect and bright light with a high proportion of blue across ceilings and walls during the morning and afternoon and thus has the effect of creating an energizing effect. 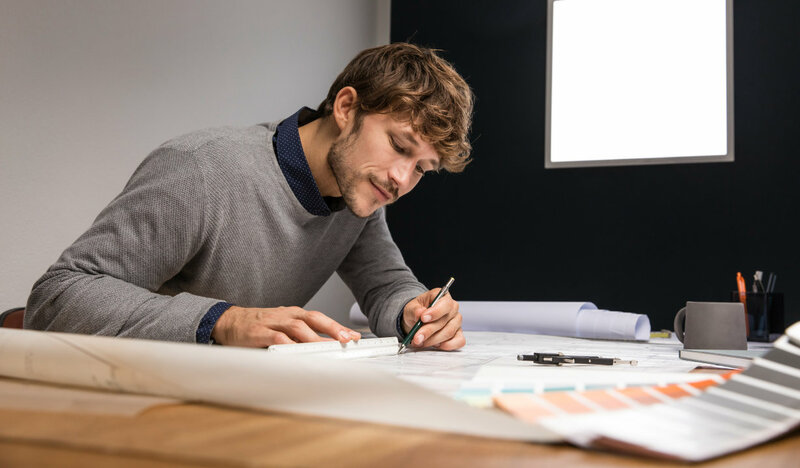 When it comes to the luminaires that shine light directly onto the workplace on the other hand – for example desk lighting – it should be possible for employees to also control these individually. These luminaires ideally create light with a higher proportion of red so that the energizing effect is not strong in the evening or at night. This is the time people are especially sensitive to the non-visual effects of light, in other words to brightness and the blue content of light. Solutions are therefore required especially for shift work models, which ensure adequate alertness and ability to concentrate, but which if possible throw the biological clock minimally out of its rhythm. In the example of an industrial company with 1,000 employees, A.T. Kearney assumes that productivity in the case of Human Centric Lighting would increase by 4.5 percent compared with a standard LED solution. Among the positive effects are a lower error rate, fewer sick days and extended service lifetime. The estimated benefits of HCL of more than 2 million euros (2,160,000) are forty times higher than the electricity costs of 54,000 euros (compared to 42,000 for a standard LED solution). Recently published studies in the office environment even show potential for productivity increases of 10 percent if HCL is implemented as part of a holistic approach together with other improvements in the working environment. Educational facilities in particular place strict demands on the lighting concept. Educational facilities in particular place strict demands on the lighting concept. The sleep-wake rhythm alters for many teenagers on entering puberty. They go to sleep later in the evening and are frequently not fully receptive when the school day starts. This poses a learning disadvantage in particular for the “owl” chronotype as they are known, in other words those students who only become alert later. Energizing light in the morning can be somewhat compensating for them – especially during the darker time of the year. Additionally it would be helpful to introduce a later beginning of school. Apart from students, the lighting concept also has to take account of the teachers, where they are positioned and their line of vision. It is also important to bear in mind that different lighting scenarios are needed for concentrating, for relaxed reading, for music, art or a presentation with overhead projector or whiteboard. Another critical factor: if the circadian rhythm is enhanced by Human Centric Lighting, this has a positive effect on sleep quality at night. This in turn allows information acquired during the day to be processed more efficiently by the brain at night and then retrieved again later. 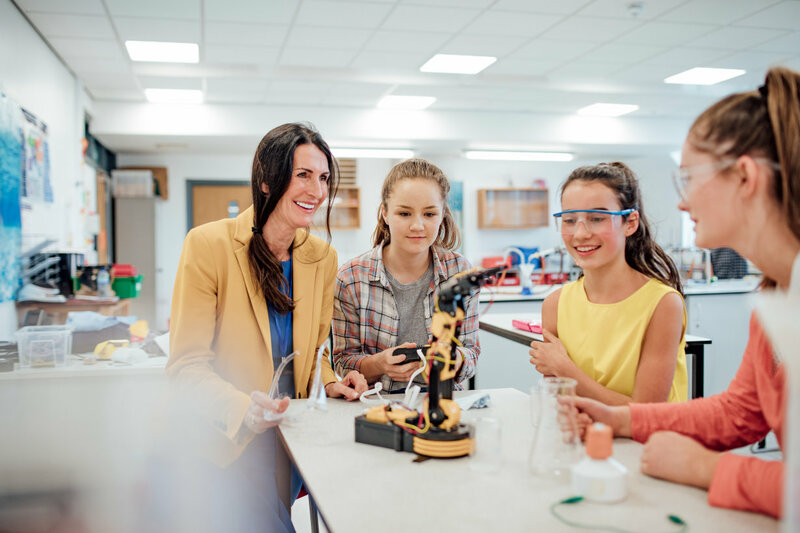 The A.T. Kearney study assumes in its calculations that in a school with 1,000 students and 80 teachers, the electricity costs for Human Centric Lighting amount to some 11,000 euros (compared to 8,000 euros for a LED solution). However, the cognitive performance of students would increase by around 15 percent by contrast. The calculation also allowed for the fact that psychological pressure on the teachers, such as stress and burnout, as well as the associated sick days could be reduced and the length of time teachers remained in the teaching profession could be increased. All of these benefits would add up to more than 40,000 euros per year and therefore exceed the electricity costs almost fourfold – quite apart from the overall economic benefits as a result of better learning results. Human Centric Lighting can stabilize the biological rhythm, help to lift the mood and prevent depression. Older people as well as those who are ill or in need of care not only require a good level of care rather also a lot of and especially high-quality lighting. On one hand this is because physical restrictions, injuries and illnesses have to be overcome. On the other hand, older people suffer increasingly from clouding of the eye lens, while at the same time their eyes respond sensitively to glare. A Human Centric Lighting concept in the medical and care sector also has to take account of the special physical and psychological stresses that staff members are exposed to – doctors, therapists as well as nursing staff. A maximum level of natural light and artificial light that is optimized for natural daylight variations is essential for a biologically effective lighting concept – at least for communal rooms and corridors and better still for treatment rooms and patient rooms in order to reach patients, residents and staff over the longest possible time period. At night then on the other hand, those present should be exposed to as little light as possible. Human Centric Lighting can then stabilize the biological rhythm of all concerned, help to lift the mood and prevent depression. The positive effect of HCL has also been proven with older people suffering from dementia. To put it into figures: according to the A.T. Kearney study, the annual efficiency gains that can be achieved with Human Centric Lighting in comparison with a traditional LED solution in a hospital with 1,000 beds and 1,500 employees – as a result of improved bed occupancy, faster recovery times and lower treatment costs for example – amount to more than 300,000 euros. The electricity costs of some 170,000 euros that accrue in this respect compare with 130,000 euros for a traditional LED solution. Warm white light is recommended in the evening for relaxing. People who work from home during the day basically have the same lighting requirements as in the workplace. It is particularly important in the home setting in the evenings to avoid disturbances caused by the blue content of light and to use a warm white, more yellowish to reddish light. Apart from reading lights or the bathroom light, this applies especially for the light from computer, tablet or smartphone screens in the hours before going to bed. The bedroom especially should be largely in darkness at night, though people are less sensitive to disturbing light stimuli in the evening if the body has been exposed to a sufficiently high dosage of light during the day. A light on wakening that slowly gets brighter in the morning can help to accelerate alertness. Bright daylight white light in the bathroom and at the breakfast table promotes activity and alertness and thus also well-being for a good start to the day. Evolution has adapted important biological processes in the human body to a life with a natural day/night rhythm. 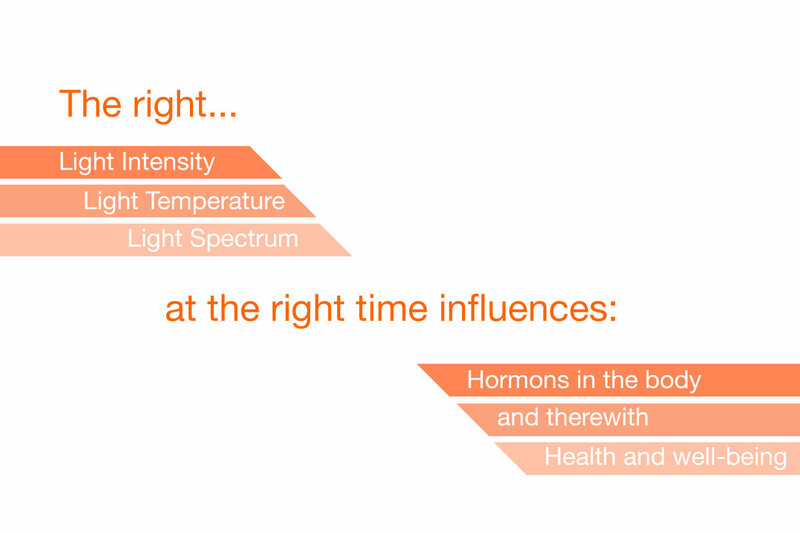 Just as thousands of years ago, people today therefore need daylight or a comparable artificial light as an impulse generator for the body clock and the associated biological processes. In short: what is needed is person-centered LED lighting that can be adapted to follow the progression of the day and to the individual situation, in other words Human Centric Lighting. The technology required to achieve this already exists to a large extent today. LEDVANCE develops such lighting solutions and will provide suitable products.